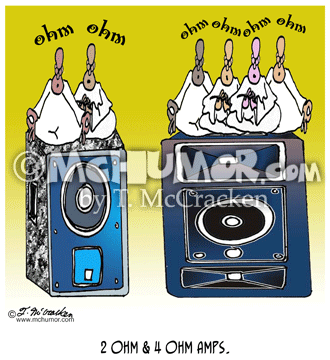 Music Cartoon 7488: An amp blowing up and knocking a musician down. 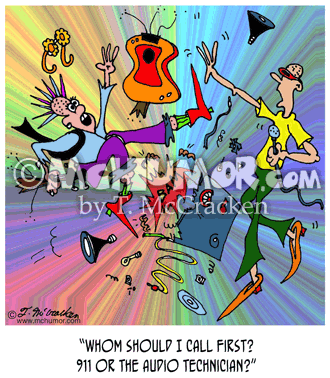 Another asks, "Whom should I call first? 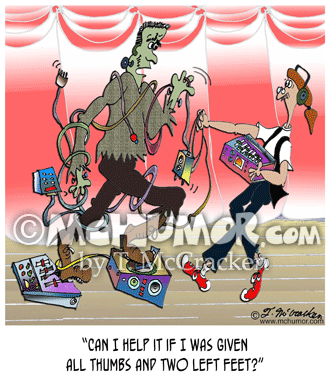 911 or the audio technician?" 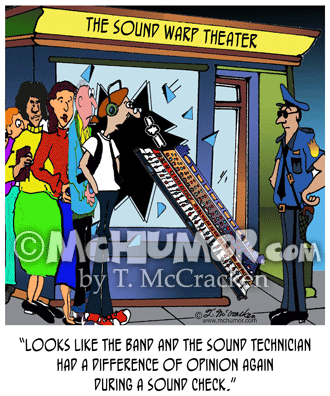 Music Cartoon 7562: When a mixing board is thrown through a nightclub's window someone says, "Looks like the band and the sound technician had a difference of opinion again during a sound check." 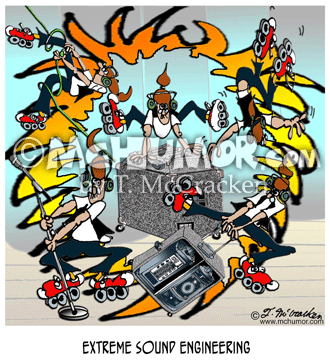 Audio Cartoon 7662: "Extreme Sound Engineering." Audio technicians work mixers and stuff while roller skating through hoops on fire. 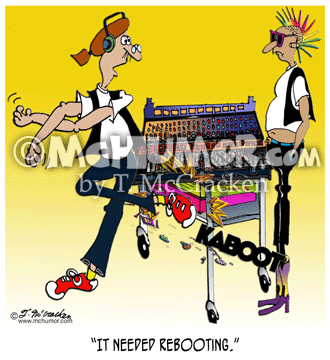 Music Cartoon 7668: A sound engineer kicking a digital console and saying to another, "It needed rebooting." 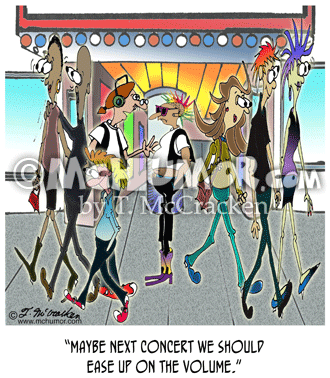 Music Cartoon 7492: A little girl listening to a bear play a guitar saying to a technician, "Too loud ... Too Soft ... Just Right." 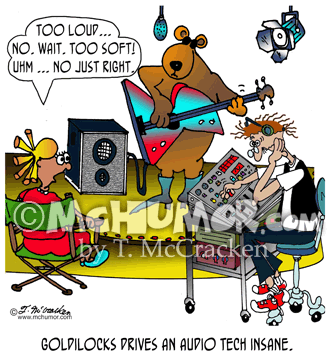 "Goldilocks drives an audio tech insane." 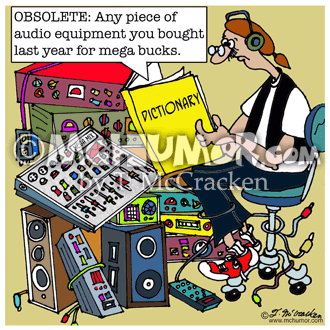 Music Cartoon 7487: An audio tech sees the definition of "OBSOLETE" in a dictionary as, "Any piece of audio equipment you bought last year for mega bucks." 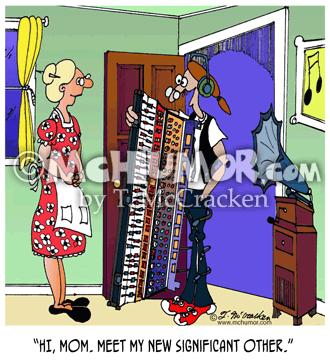 Engineering Cartoon 7489: Someone hugging a mixer stands at the front door and says, "HI, Mom. 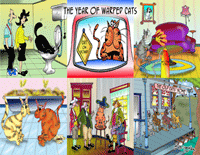 Meet my new significant other."